A large tank battle would be fought at the gates of Warsaw. On 30 July the 16th Tank Corps closed in on the city, to relieve some pressure on its sister formation, the 3rd Tank Corps, which was under attack from four German armored divisions to the east. The 16th broke through the German lines at Świder and seized Wiązowna, continued toward Warsaw - not only threatening to seize the city and its bridges across the Narew River, but also to cut off the divisions fighting to the east. At the village of Zakręt, German infantry and Jagdpanzers awaited the onslaught. 2019-03-23 (A) David Garvin vs Kedge Johnson Russian win This game was over on the top of turn 2. On turn 1, I set my T 34-85s up such that they threatened the multi-hex building on board 71. I then rushed and stripped concealment from the defenders: 8-0 and 447, 447 and MMG and a JagdPanzer IV. I survived all defensive fire and even got a fanatic half squad out of a k/2 result on me. I ended up capturing the building on turn 1, and entered into CC with the Jagd IV. His schnoogiewoofer rolled a 12 in CC and he also was immobilized by a T 34 shot. My M 10s went two ways: one to reinforce the attack on the buildings and the other to cover a possible flanking manoeuvre. His reinforcements came in to counter attack. My defensive fire was mostly ineffective except for a flanking shot I got on a Panther. I also got the Jagd IV to shock and then destroyed it in his CC phase of turn 1. To add insult to injury, his second Jagd IV malf'd his main armament. On Turn 2, I lost a T 34 to Recall and then went to swarm his Panther on my right. 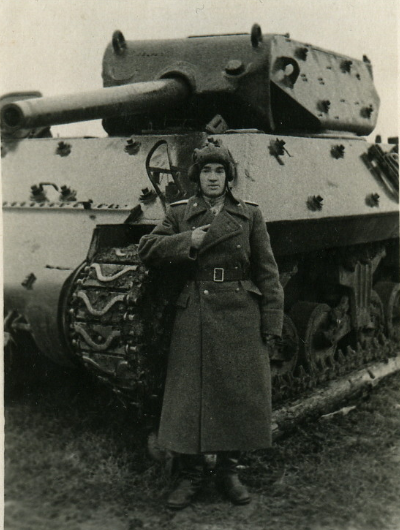 The first there was an M-10 that the Panther rotated his turret to fire at and he brewed up. Then another M-10 came from the front but just missed on the bounding shot. His Panther shot and just missed on his Intensive Fire shot. Finally, a T 34/85 moved up adjacent using ESB to stop (yes, he stopped. Permanently!) Then my bounding fire shot hit him and destroyed the second Panther. So, since it was the top of turn 2 of a 6 turn game, down to 1 tank and having to counterattack just to get the building back against swarms of elite Soviets already in the stone building, my opponent tossed in the towel. Soviet win. 2019-02-06 (A) Paolo Cariolato vs Federico Corso Russian win The must play scenario of this pack. 2019-01-19 (A) Stephen dedier vs Holt, Jim Russian win This was actually myself and Brent playing against Jim. It was an AFV lesson for myself and Jim from Brent since we can both use help with AFV's so there was a lot of making sure we all knew the possibilities for most of the moves. I wanted to track here so I keep it on my list. Russians pushed very hard up the middle with CX and also riders. lesson 1, use some of the initial dummies as 5/8" counters to confuse the location of the initial tanks. This allowed the Russians to immediately threaten the wood buildings and the initial stone buildings. Jim decided against the trucks and pushed his Panthers to defense of the wood buildings and infantry split into 2 reinforcement groups. Lesson 2 if you keep your tanks in motion you are somewhat less succeptible to attack but you can't get off any decent shot. A fight ensued for the wooden buidings with the Russians managing to immobilize one Panther and kill another in infantry CC. Lesson 3 don't let Concealed infantry get into CC with your AFV! It's just as bad as it is with infantry exept easier for the infantry to get the ambush. 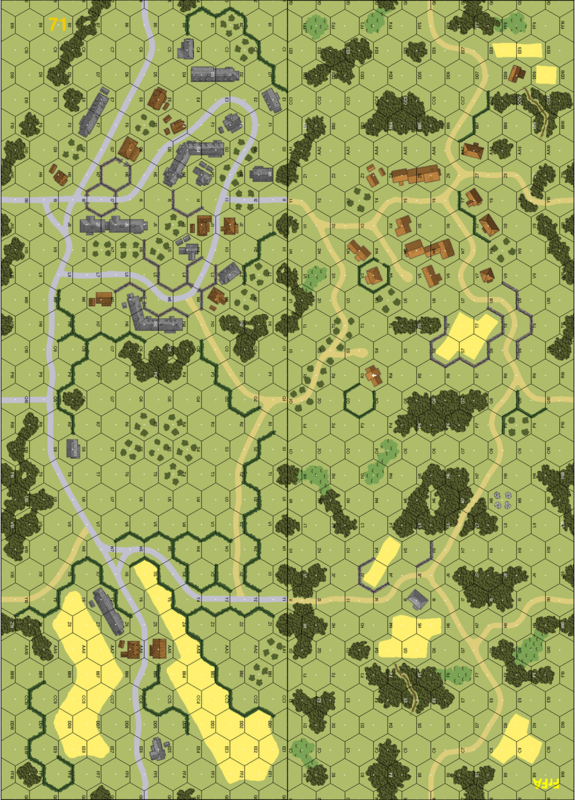 After a battle of attrrition, the Russians were able to load up a squad run to a back concrete building and offload/advance to get into a victory building. They also occupied one wood building and threatened another concrete. This left the Germans only hope as a dash for the originally German held back building with failed. It was a good lesson and i learded a lot about armor tactice. Not sure what I remember. Thanks to the guys for a very long game because of all the rules we kept going through.